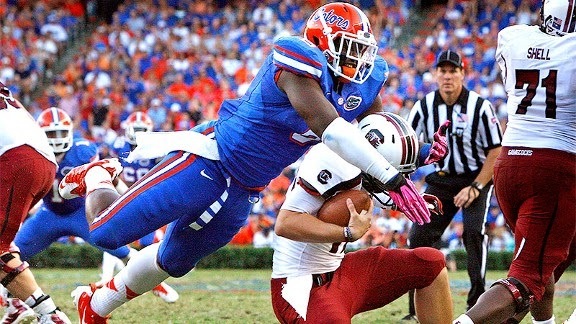 With the 2nd pick in the 2015 NFL Draft, the Jacksonville Jaguars select Dante Fowler, defensive end from Florida. Fowler is the 47th Gator drafted all-time in the first round and tied him for the highest a Gator was picked since the 1966 NFL-AFL merger. UF has had 12 defensive lineman in the selected in the first round since 1989, which is most of any school over that span. Jacksonville has now drafted nine Gators, most recently selecting Josh Evans in the sixth round of the NFL Draft. In addition, Fowler joins Fred Taylor (1998), Reggie Nelson (2007) and Derrick Harvey (2008) as Jaguars first round draft picks from Florida. UF has now had at least one pick in every NFL Draft since 1952, longest streak in the SEC. Jacksonville desperately needs a playmaker on the defensive side of the football after spending last offseason working on the offensive side of the ball. They think they have their man in Fowler, who dominated as a pass rusher at Florida down the road in Gainesville. Fowler will provide a bland Jaguars defense with explosiveness and tenacity, and is a perpetual threat to get to the opposing quarterback. Fowler declared for the NFL Draft after his junior season after being named a Second Team All-American by Sporting News and Walter Camp, and a Fourth Team All-American by Phil Steele. In addition, the St. Petersburg product earned Honorable Mention All-America honors from Sports Illustrated. From the SEC, he was selected as an All-SEC First Team performer by the leagues’ coaches, ESPN.com and Phil Steele. Fowler was also voted the Defensive MVP and Ray Graves Award winner (Overall Team MVP), and was selected a season captain by his teammates. Statistically, Fowler finished the 2014 season fourth on the team with 60 total tackles and led the team with 15.0 tackles-for-loss and 8.5 sacks. Overall, he played in 32 games for the Gators and made 26 starts on the defensive line. He recorded 72 total tackles with 18 tackles-for-loss and 5.5 sacks in his career. Jameis Winston watched from Bessemer, Alabama, as he heard his name called in Chicago.The Tampa Bay Buccaneers selected the Florida State quarterback with the top pick of the NFL Draft on Thursday. Winston becomes the first Seminole ever drafted No. 1, surpassing the previous high of No. 3 (Andre Wadsworth, 1998, Arizona Cardinals). The Bessemer, Ala., native joins fellow Seminole quarterbacks EJ Manuel (Buffalo Bills, No. 16, 2013) and Christian Ponder (Minnesota Vikings, No. 12, 2011) to give Florida State three consecutive signal callers drafted in the first round. It’s the first time a team has ever had three quarterbacks drafted in the first round in a five-year span in the modern era. In addition to being the highest picked Seminole ever, Winston is the 12th Top 10 pick in FSU history and 41st Seminole selected in the first round. He is the sixth first round pick and 26th overall draft pick under Jimbo Fisher, who became head coach in 2010. Winston had a dazzling two-year career as Florida State’s starting quarterback, becoming the youngest player ever to win the Heisman Trophy while leading the Seminoles to an undefeated BCS National Championship season in 2013. He won his first 26 starts and led FSU to the first-ever College Football Playoff Semifinal in the Rose Bowl in 2014. He wrapped up his career with FSU and ACC records for career pass efficiency (163.28), passing yards per game (295.0) and touchdown passes per game (2.41). He led the nation with four fourth-quarter comebacks in 2014 and had five for his career, including the 2013 BCS National Championship when he engineered a seven-play, 80-yard drive that culminated with the game-winning touchdown pass to Kelvin Benjamin with 13 seconds left in the game. Winston was the first No. 1 pick not to attend the draft since Dan Wilkinson in 1994. There was very, very little doubt Winston was going to go first overall as the most pro-ready quarterback to a franchise desperate for a signal caller. Obviously the concerns about Winston off the field will persist, and it’s yet to be seen if he can grow up. But from a football standpoint, the pick makes the most sense. He has arm strength, accuracy and always keeps his eyes downfield. All quarterbacks need time to develop into professionals (Winston in more ways than one), but he’ll need the least amount of time to reach his full potential. Give him Vincent Jackson and Mike Evans to throw to, and the Tampa offense could be dangerous in that NFC South. The draft is being held in Chicago, the first time in 50 years that it’s not in New York. The Miami Dolphins exercised the fifth-year option on quarterback Ryan Tannehill’s rookie contract on Thursday. Tannehill is now under contract through the 2016 season. The 26-year-old threw for a career-high 4,045 yards with 27 touchdowns and 12 interceptions in 2014. He added 56 rushes for 311 yards and one touchdown. The eighth overall selection in the 2012 NFL Draft, Tannehill has started all 48 games in his career and has completed 61.9 percent of his passes for 11,252 yards with 63 touchdowns and 42 interceptions. Additionally, he has totaled 145 rushing attempts for 760 yards and four rushing touchdowns.